The suede around the toe and the leather in the toe box stretch. I would recommend you to purchase your true size. I was impressed with the break in period for the Gato. It took me about three or four sessions to break these in and allow them to stretch. I believe they cost around $70 CAD. The price is better than previous and current top of the line indoor/futsal footwear. The full grain leather provides a good feel of the ball. The shoe is well cushioned for the hard tile, it is a good choice for those with bad knees (also a Lunarlon model available). As stated before, my experience with the break-in period was very impressive. The only negative I can think about is the grip. It takes a while for the sole to become "grippy". 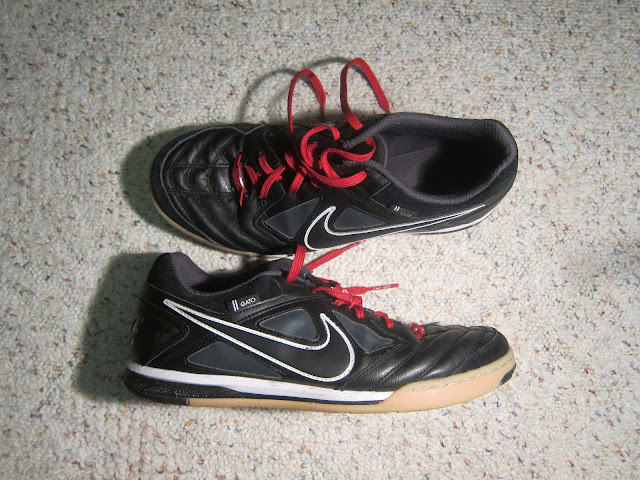 I spent my first few games slipping, many Nike indoor shoes are this way. In time they become better, but you can also spray the bottoms with hairspray. These shoes are good for all of the basics: passing, dribbling and shooting. I recommend them based on their price and their performance. A Nike representative told me that these are one of their more popular indoor shoes in Canada.